This first impression falls on National Hot Dog Day! Where else better to celebrate than here? Hot dogs are an (almost) American food. There’s no BBQ, no Sports Event, no Carnival complete without a juicy, meaty hot dog. Since I can’t turn down a good hot dog, I decided to give it a try. The story of Umai actually begins back in the 1990’s, when their founder Loi Tran opened up an old hot dog cart given to them by a family friend in San Jose. With no real working knowledge of how Americans ate hot dogs at the time, Loi and his wife created combinations based on what they thought tasted good. The name Umai, which is Japanese for “Yummy” was the name chosen for the business and the rest, as they say, is history. What amazed me the most was the variety of items available for you to try. 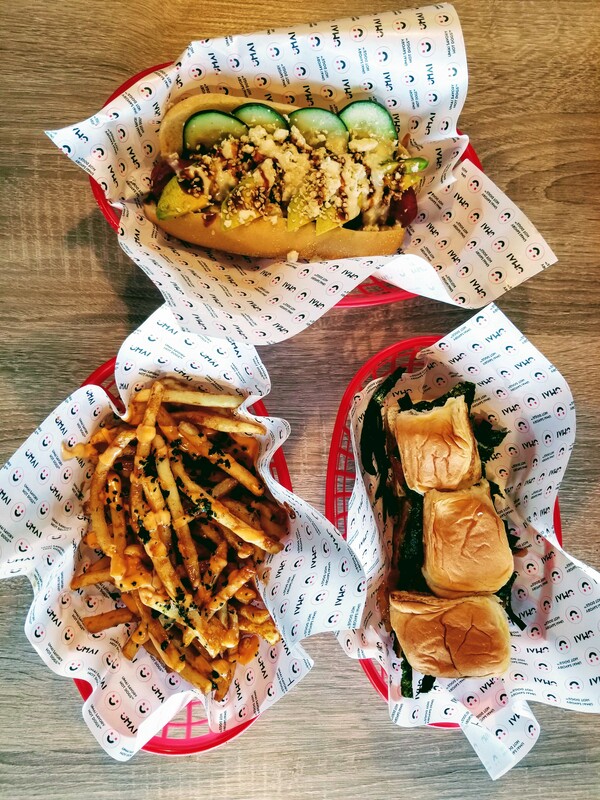 In addition to the hot dogs themselves, they offer burgers, noodles, wings and other selections from their take on a corn dog (a waffle wrapped around a hot dog weiner) to some delicious spam musubi sliders. For my first visit, I ordered the California Bae, some Spam Musubi sliders and some fries. I have to say that out of all three of those items, I enjoyed the California Bae the most. A chicken hot dog covered in creamy avocado slices, crunchy cucumber, and savory feta cheese was one of the most interesting combinations I’ve tried before. On my Second visit, I gave the Bacon Maco and the Houston Honcho a go, as well as a Waffle Dog. The Waffle Dog, while clever, missed a bit of the mark of the Corn dogs Im used to, but not for a lack of trying (I should’ve gone for the maple syrup like the cashier suggested, as I might have enjoyed it more). I really enjoyed both of the hot dogs I ordered. Albeit, both were a bit messy, the hearty chilli and cheese versus the cheesy, bacon (there was legit mac and cheese on this thing, and it was covered in crushed doritos too), but for a hearty experience, these two dogs can’t be beat. 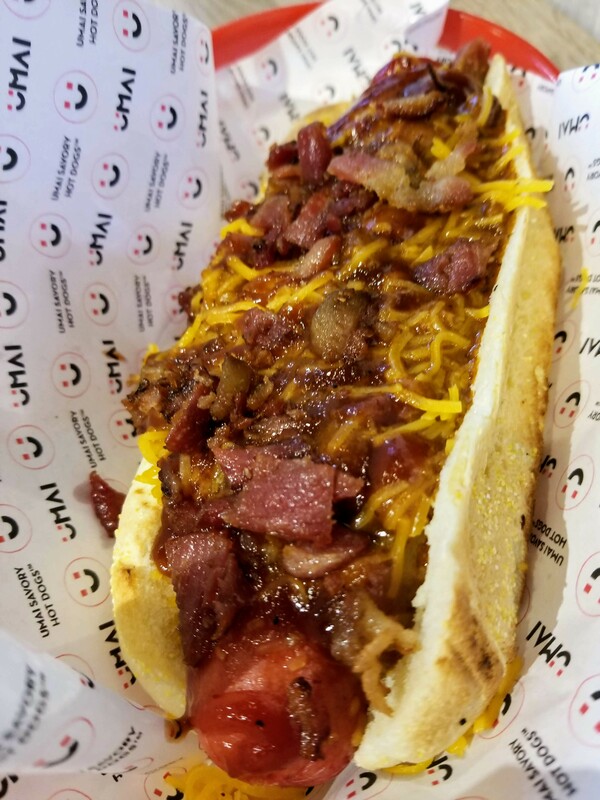 If you’re looking for a fresh interpretation on the American classic, stop by and see what’s cooking at Umai Savory Hot dogs today. UMAI Savory Hot Dogs is located at 1158 N. Capitol Ave in San Jose. Cash and Card are accepted. They’re open Sunday through Thursday 11am to 10pm and Friday and Saturday 11am to 11pm.